So, for quite some time, I've been meaning to buy a smartphone to replace my current dumbphone and iPod Touch 2G combination. It had worked fairly well for most of the last few years, with a few exceptions, but I was getting tired of carrying around 2-3 devices with me (depending on if I needed a camera or not) and iOS 4 was very problematic. I was left to choose between a stable, responsive device (downgrading to 3.1.2) and one which could continue to install most apps from the App Store. My iPod Touch 2G was also looking like it would soon fall completely to the onslaught of planned obselence breathing down it's neck, as updates such as iOS 4.3 did not appear to support it, and many apps ran unacceptably slowly on it. Initially I had hoped to buy a device in roughly the price range of a new iPod Touch, at around €300. This obviously ruled out the iPhone, but I reckoned that once I'd eliminated the Apple tax, I'd be able to get an acceptable smartphone for that price range. As some of you already laughing at my naivety have guessed, I was wrong on that point. The sub-€300 price range was represented by a cheap Vodafone branded phone, the obsolete-at-birth Sony Ericsson X8, and the Samsung i5500 and HTC Wildfire, both of which had a screen resolution identical to my 3 year old €80 dumbphone, the Sony Ericsson k800i. Nice job guys. I know it's relatively the budget end but you're selling a smartphone that has fallen at the first hurdle to a 3 year old phone at 1/3 of the price. So with the budget end ruled out, I waited a while until I had enough cash and decided to have a look at more expensive phones. The iPhone? €460 for the obselete 3GS, €600 for the iPhone 4. Pass. Around the €400 mark, I noticed the HTC Desire. It was certainly well reviewed and the 3.7" screen was roughly around the size I wanted. It did however look a little dated with the HTC Desire HD and HTC Desire Z having been released since. None of the networks here sold the Desire Z, which limited my HTC choices to the HTC Desire or the Desire HD. There was also the Samsung i9000 hanging around that price point also, but the general consensus I got from people I knew was that HTC was the better of the two. 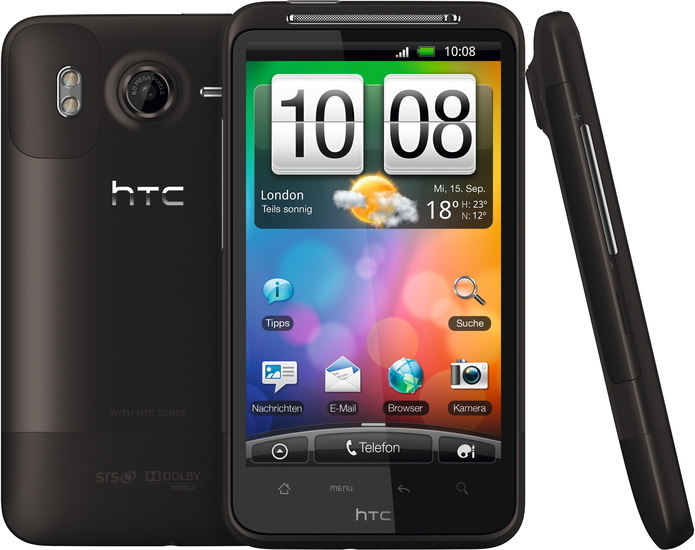 So, with the choices down to two, I agonised over the HTC Desire vs. the HTC Desire HD. While the HTC Desire HD was €50 dearer, that wasn't a major factor. Instead, I was worried that the 4.2" screen was too big for practicality. However, that decision was made for me pretty quickly when HTC announced the Desire S, a definite replacement to the Desire. Not as you might think, to wait for the Desire S, as with the phone networks here there is no telling how long that would be, but for the Desire HD. So pretty quickly I went into the store to buy it. I know, I know. You bought it in store? What a caveman! However, the online discount of €30 was only slightly more than the €20 discount I got in store from switching from O2 to Vodafone, and I find it always helps to be able to shout at a specific store if things go wrong. When I'd first bought my iPod Touch, one of my initial thoughts was how much better the screen looked than any other device I'd owned before. While people with Retina displays might scoff at the 800x480 screen on the Desire HD, that too managed to inspire the same reaction, being a huge improvement over my old iPod Touch's 320x480 screen. Performance was a huge improvement too, although anything would have been as iOS 4 completely destroyed any semblance of responsiveness in my iPod Touch. However, it still seemed faster than my iPod had been under 3.1.2 and than my friend's 3GSes (none of them had an iPhone 4 for me to compare with). It's more stable than iOS from what I've seen so far. Safari used to crash on a fairly regular basis, occasionally requiring the entire iPod to be rebooted. However, I'm not willing to make a final judgement on this until I've used the device a bit more, and twice I've hit the home button to be brought back to a Loading dialog for a minute instead of my home screen, as if the home screen app has been closed. Compared to an unjailbroken iOS device, the vanilla Android experience is extremely well featured. Notifications are handled much better, though the pull down UI was a bit unusual. I like the idea of the letters typed appearing above the area occupied by my fingers, though on my first few uses as I got used to it from iOS, I had to shrug off the feeling that I was hitting the wrong button upon seeing this. One annoyance when typing that I still mess up is that the close keyboard button occupies the space taken by the button to bring up numbers and symbols on iOS devices. I've heard that this keyboard is HTC specific, but I haven't access to any other Android device to check at the moment. Applications are pretty good too. My must have App Store apps on an iOS device are Twitter, Canabalt and Angry Birds. Far from a huge collection, obviously, as I got bored of most other apps and removed them eventually, and for some found they never worked that well anyway on my iPod (Call of Duty, Simcity, etc.). Angry Birds is on Android, free too, though the ads are somewhat annoying. If they offered a paid no-ads option I would probably buy it again. Canabalt is not, however my device has a flash player, so I can actually play it on Canabalt's website. I probably won't, because it's not the most practical, thought it was a funny discovery. Twitter was already included on the device, and my first few comments were about how it was inferior to Twitter for iPhone, but acceptable. A quick search of Twitter clients (Twidroyd, HTC Peep) failed to show up anything better so I stuck with Twitter for Android. However, I soon discovered that preinstalled apps don't auto update, and manually installing it from the Market got me Twitter for Android 2. 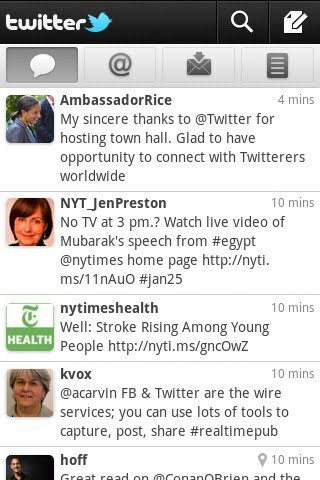 Which is pretty close to the iPhone app, missing only the My Tweets, Retweeted functionality. On the plus side, it has no dickbar. Moving onto jailbreak applications, my must haves were sbsettings, MxTube, and.. and.. well that was about it really at the end. sbsettings I do miss, mainly for the brightness control, as auto brightness (on either device) never seems to set brightness to the minimum, which makes using the device when it's anyway dark rather painful. MxTube had tons of equivalents on the Android market, and the one I went for is TubeMate. It's a bit clunky, but it'll do. I also found plenty of GBA emulators. While there was one on the iPhone, gPSPhone, which I used when it was free, I just kept the free version until I updated to iOS 4 which it no longer worked on. Since iOS 4 had performance problems, I never bothered with any emulators on it. There is also a PSX emulator, FPSe. It's very nice, and unlike on my iPod Touch 2G, it runs the games at an acceptable speed without ruining the sound. There is also psx4droid, which I tried, but putting a ROM on it took more than 15 minutes so I missed the refund window when I discovered it was too slow. An interesting fact about these emulators is that they are on the Android Market, and worked without rooting, unlike the iOS ones which required Cydia and a jailbroken device. Likewise, other jailbreak features such as custom themes and a slide down app launcher (part of sbsettings) are inbuilt into the software. Anything that saves on potental warranty voiding is always good. One of the nicest features of Android is how syncing works. Take files, drag and drop to device, either by plugging it into a computer or by using sftp over an app running on the device (I use SSHDroid but it was literally the first I found). No crapware programs, and none of the horribly painful bloat that is iTunes. On the negative side, this does make album art a bit more difficult to manage. All in all, I'm fairly happy with my new phone, though there are still a few teething issues, such as the close keyboard button placement, and my tendency to not use the search key in a lot of cases where I should.